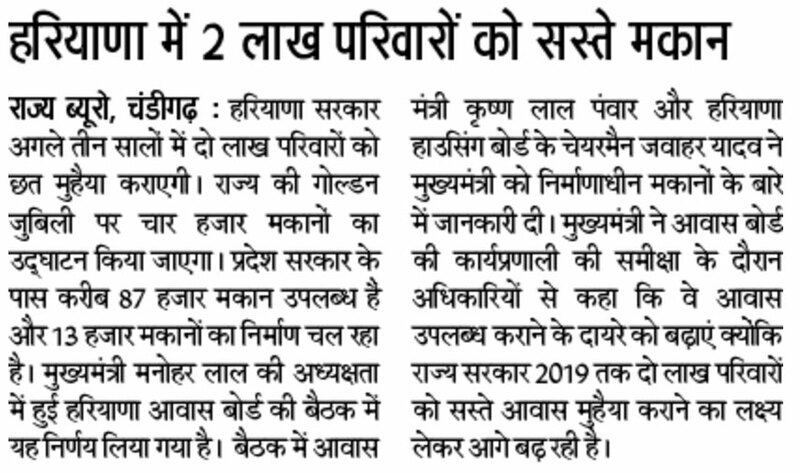 State government of Haryana will provide a shed to 2 lakh families of Haryana in upcoming three years. An update is published in Jagran newspaper according to which the state government will inaugurated 4,000 houses on the Golden Jubilee of Haryana which to be allotted by the government authority. According to the source, the state government has an availability of 87 thousands houses, besides that houses a construction work of 13,000 houses is on progress. The decision was taekn in the meeting of Haryana Housing Board and the meeting was organised in the chair of Chief Minister Manohar Lal Khattar. The meeting was also attended by Krishan Lal Pawar, the Housing Minister and Jawahar Yadav who is a Chairman of Housing Board. During the meeting they had given a detail of under-construction houses. Meanwhile, the CM instructed the officials of Housing Board to extended the limit of constructing houses because the government is stepping forward with a aim to provide a house to around 2 lakh families.